Have you ever wondered what it's like in the giant facilities where Google keeps all your data magically tucked away, ready at the tap of a screen? Well today, you can explore one such data center, street view style. An accompanying video will take you on a guided tour, showing you how the internet giant stores your data, keeps it cool, and destroys it when hard drives fail. Of course you can also walk around the building by yourself, and we certainly suggest you do, as there are plenty of easter eggs. Would you expect anything less from Google? A lone storm trooper guards your data. The whole set up is rather interesting, and there's no shortage of things to see. It's not all business either. In addition to wandering around rooms filled with servers and routers, you can explore the lounging and cafeteria areas that Google employees enjoy. This particular data center appears to be racing themed, so you'll spot plenty of paraphernalia on the walls and in the halls. It's rather enjoyable to see the brightly colored home of every one of your searches. 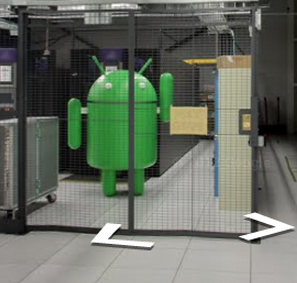 We'll let you find the giant Android that, despite all its rage, is still just a rat in a cage.